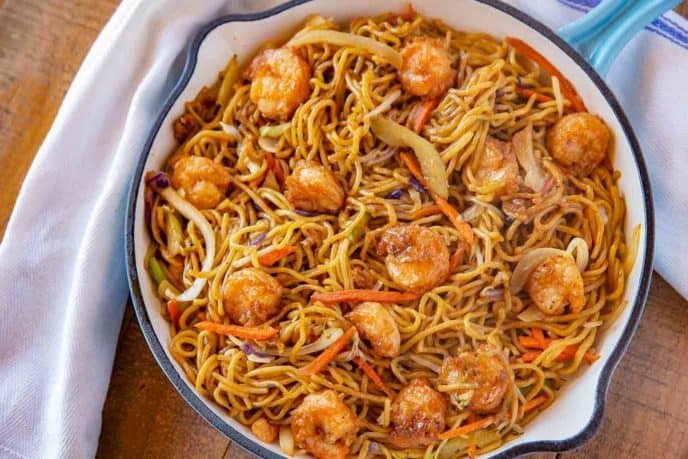 Shrimp Chow Mein is a homemade version of your favorite take-out dish, made with shrimp, veggies, and chow mein noodles in a savory sauce, ready in under 30 minutes! 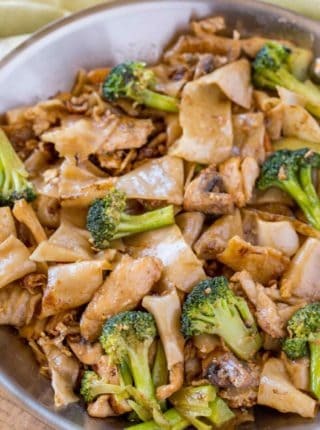 Chinese Noodles are a fan favorite on the blog including Chicken Lo Mein, Pad See Ew (Thai Stir Fried Noodles) and Easy Pad Thai. Shrimp Chow Mein is one of my all-time favorite take-out dishes, and it’s insanely easy to make right at home! 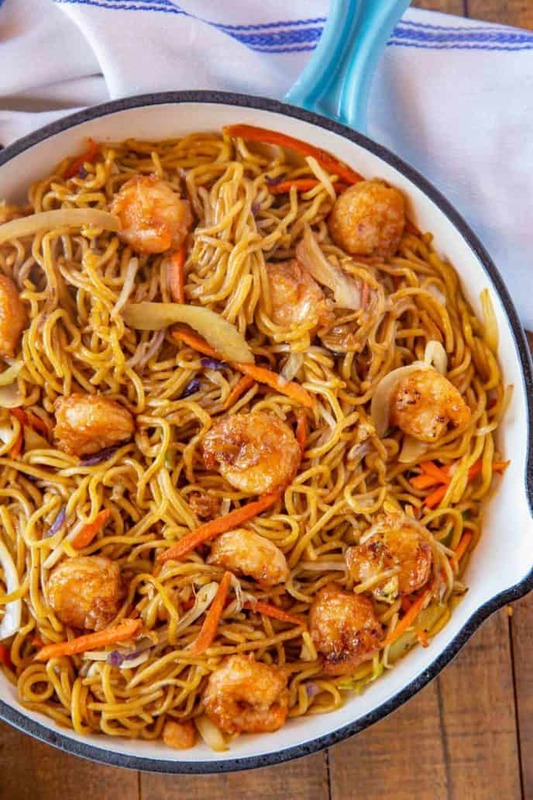 This chow mein is the shrimpier version of the Classic Chinese Chow Mein made with fresh shrimp, vegetables, and a savory sauce tossed with chow mein noodles and bean sprouts. There is not a lot of prep time needed for this, because the whole thing takes a total time of under 30 minutes to prepare. Plus it’s done in just one pot (or wok), so cleanup is really easy. WHAT IS THE DIFFERENCE BETWEEN SHRIMP CHOW MEIN AND SHRIMP LO MEIN? 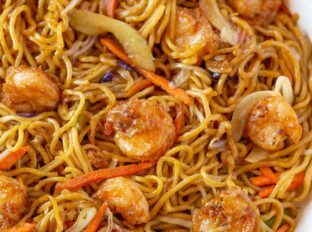 Both dishes use egg noodles, but shrimp chow mein uses specific chow mein fried noodles, while lo mein uses noodles that are boiled. 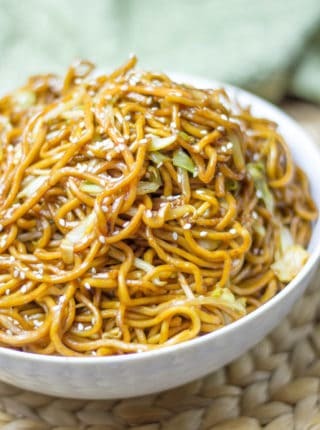 Lo mein also typically has more sauce in the dish than chow mein, while chow mein has more oil and is crispy in texture because the noodles are fried. WHAT OTHER VEGGIES CAN I ADD TO SHRIMP CHOW MEIN? HOW LONG DOES SHRIMP CHOW MEIN LAST? Shrimp chow mein will last refrigerated in an airtight container for 3-4 days. When reheating, add a tablespoon or two of water to the dish, to keep the noodles from drying out. Can’t find chow mein noodles? You can substitute yakisoba noodles and just toss the packet and use the noodles only. 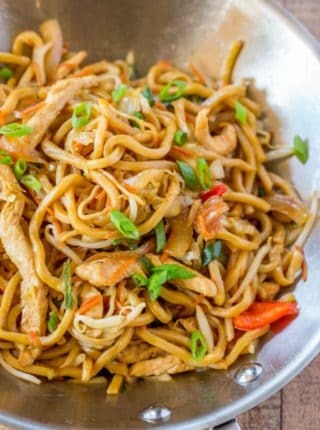 You can add 1/2 teaspoon of powdered ginger or a teaspoon of minced ginger to the chow mein for more flavor, or 1/4 teaspoon of cayenne pepper or a dash of sriracha for heat. If you want to make this vegetarian, you can substitute the shrimp with extra firm tofu. Part of what makes Chinese food taste so good is the way the wok works with the heat. Try to keep your wok or pan really hot, and pay close attention while stirring to make sure the food quickly cooks instead of burning. I like to use a more traditional wok, but you can find electric ones if you don’t have a gas stove. 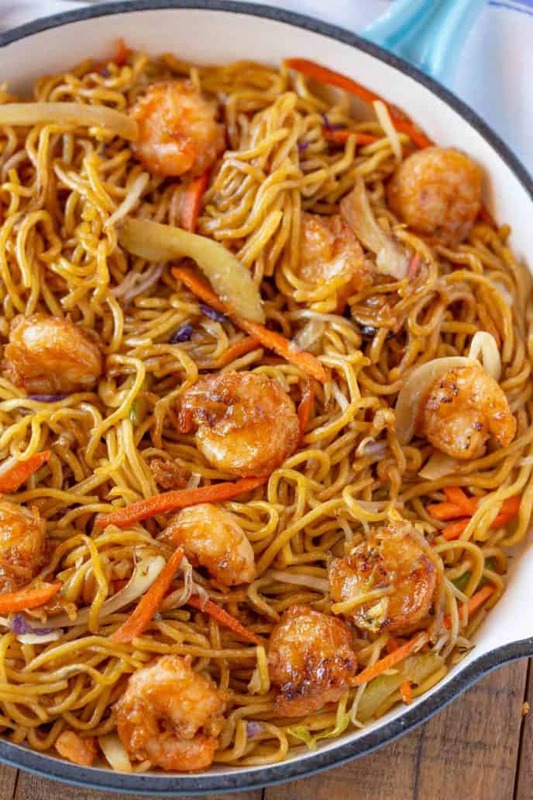 This shrimp chow mein recipe calls for either regular or light soy sauce, I do not recommend using dark soy sauce for this chow mein. Try to have everything prepped ahead of time, like the veggies or the sauce, because this dish will cook quickly. I would have your noodles cooking in hot water while you’re prepping your veggies, then have them ready to go when your shrimp goes in. This recipe calls for shrimp but you can make it with pork, beef, prawns, or chicken, too. I like to use chicken breast for a leaner cut of meat. Or make this vegetarian with extra firm tofu. 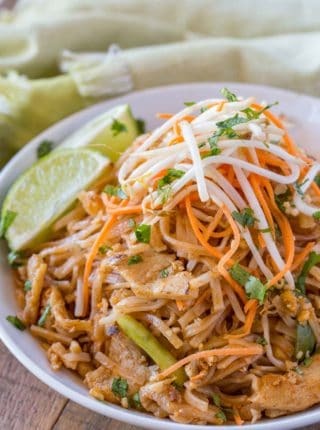 Make this chow mein lower carb by using tofu noodles, but they won’t be as crunchy as your traditional chow mein noodle. Or you can stir fry spiralized vegetables like carrots and zucchini. Made this tonight with the addition of the ginger mentioned and it was delicious. So glad you enjoyed it, Carol. Thanks for the 5 stars. This has to happen this week! Love when I have more options to eat in! Yes, so much more budget friendly too! This looks so flavorful! Love that it only takes 30 minutes! Looks incredibly delicious! This is great specially when we need something quick and easy! Why go out when you can make this yummy meal at home! Great dish! I love all those shrimp. Perfect for when you don’t feel like going out! Can you make this with substitute for shrimp.? Also, I have your Tater Tot recipe in the oven right now!! I can’t wait & will it make it too mushy if I melt shredded cheese on top rt before I take it out? I love cheese ? Yes, you can substitute with chicken or whatever protein you’d like. So glad you’re enjoying the recipes so much!